An interesting and worthy book came across my desk the other day on organizational change. The model, in short: great ideas from the frontline employees of an organization travel up through the organization and into the strategic planning of senior management. In approved form, the ideas then loop back down to the lower levels of the organization for implementation. The solutions then leave the loop and go out into the rest of the organization for enterprise-wide rollout. 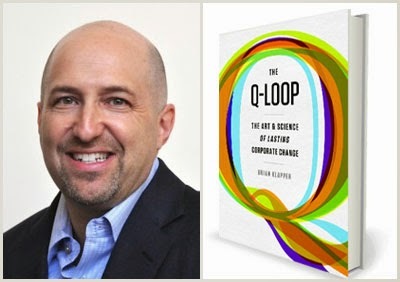 This is The Q-Loop, The Art and Science of Lasting Corporate Change, by Brian Klapper, president and founding partner of the Klapper Institute. I talk a lot about creative ideas, inspiration and velocity as the way to win, so I found a lot to like in Klapper’s blueprint for driving change that lasts from the ground-level up. 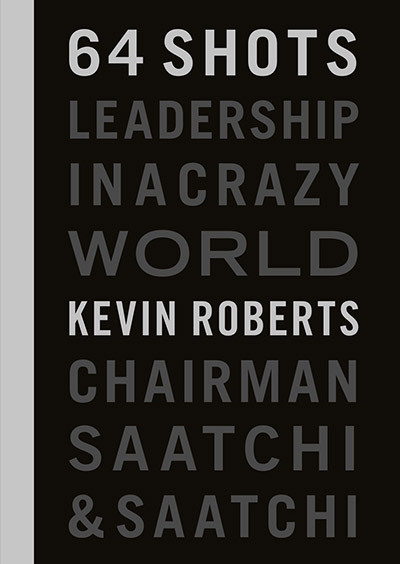 Organizations have many moving parts, change is usually hard graft, and the Q Loop is no easy task, but this book works through the steps towards making it happen. Part one (entering the loop) covers the challenge for organizations to be adaptive, the valuing /sourcing / generating / rewarding of ideas, and the use of the organization’s collective IQ through an ‘ideas quest’ which involves focus, engagement, sharing, planning and evaluation. Part two (going around the loop) steps beyond ‘conference room solutions’ and, for change initiatives selected, starts with the need to focus on a mandate and form the right team of heroes. Next - to reframe the approach - is a mindset-shifting ‘what could be’ experience to overcome obstacles. Part Three (exiting the loop) is about embedding the Q-Loop in the organization by igniting a wildfire, through sustained energy, communicating objectives compellingly, raising employees’ expectations, and making transformation an ongoing effort. The book has lots of cases, examples, interesting facts, insightful quotes and self-evaluation quizzes. It’s easy to navigate, with chapter takeaways and previews. I’m a Business Ambassador of the NZ US Council, funded by business and government to build New Zealand’s relationship with the USA. The biggest item on our radar is supporting the passage of the Trans Pacific Partnership (TPP) agreement, a major trade treaty between 12 APEC economies representing around 40 percent of global GDP. The idea of TPP is to make trade and investment easier throughout the region by reducing barriers, eliminating tariffs, lowering costs, increasing speed across supply chains, and harmonizing regulations. Progress has been made in areas such as regulatory coherence, competitiveness, development, temporary entry of business persons, cooperation, and small- and medium-sized enterprises. Negotiations may conclude in 2014, in the meantime it is a work in progress. The New Zealand Government has adopted a goal of increasing the ratio of exports to GDP by around ten percentage points to 40% of GDP by 2025. Our economic future lies in the extent to which our businesses can connect more easily in the markets of the Asia Pacific region. We need TPP to contribute to a new wave of economic growth, to expand trade, investment and job creation and to reflect the new way that business is being done. New Zealand has free trade agreements (FTAs) with nations covering 50% of our exports, notably Australia and China, which our economy has benefitted enormously from. If negotiated, TPP will deliver FTAs with the US and Japan, and freer trade with Canada, Mexico and Peru. There is public concern about the transparency associated with trade negotiations; and a range of issues are under active negotiation – rules around patents, intellectual property, copyright and the supply of medicines; e-commerce, as well as the all-important issue of market access. TPP cannot be achieved without addressing the absurdly high protective walls that have been built around agriculture in Japan, United States and Canada. New Zealand has extremely skilled negotiators (aka Tim Groser and team) dedicated to our national interests. I’m a believer in the power of music. It connects with our soul and transforms our emotions. The right tune at the right time is undeniably addictive. I have this insatiable urge to respond to the beat. We all know music can benefit our mental health, but science is proving it goes beyond that. It’s a heart healer. A new study has discovered that listening to your favourite music – joyous or relaxing music being best – can in fact strengthen your heart and improve the recovery of patients suffering from heart disease. It’s all in the endorphins. Music doesn’t just trigger an emotional response, but a physiological response. By plugging in your iPod for 30 minutes a day you can improve your vascular health. Exercising at the same time improves the results even further. If you have never marvelled at how complex, beautiful and brilliant our internal wiring is then you need to start. In this instant ‘ricochet’ age of effects we live in, Uncle Sam might well say being America isn’t all it’s cracked up to be. For Brand USA, the big smart kid on the global block, opting in or out on pretty much anything in the world yard draws a volley of opinion. So get this from a recent Gallup poll across 154 countries representing over 98% of the world’s adult population. Around 13% of the world’s adults, some 630 million people, want to leave their country and move to another place permanently. The place about 138 million of them want to move to permanently is the USA, the top choice (The next three choices are UK-42m, Canada-37m, France-31m). Potential migrants who would like to permanently settle in the U.S. are most likely to come from some of the most populous countries (19m in China) in the world. In Liberia (37%), Sierra Leone (30%) and Dominican Republic (28%), well over 25% want to move to the US. The pull toward America is not universal but worldwide well over 100m people dream of living in America – it remains the most popular destination for potential migrants. Economic opportunity is a key factor, indicates Gallup. For the flak America takes, it’s clear that freedom and opportunity still rule the imaginations of people across the world. Onwards, Captain America. Fighting Poverty through Rugby. In India? Not long ago I wrote the foreword for a book called Jugaad Innovation. It’s about doing more with less. Being flexible and frugal. Challenging the conventional top-down approach to innovation and championing breakthroughs through simplicity. Recently one of its co-authors Dr Simone Ahuja shared a story that I couldn’t let pass. Simone has strong media creds and recently spent time in India researching and co-producing a segment about social entrepreneurship for a PBS NewsHour television series “Agents for Change.” She knows of my passion for rugby and it was actually rugby that first alerted her to this story. In 2008 an under-14 rugby team from the remote tribal regions of India travelled to London to play in the International School Rugby Tournament. Getting there was an achievement in itself. More extraordinary, they defeated the South African team in the final by 19-5. Simone learnt this team came from the Kalinga Institute of Social Sciences (KISS) in eastern Orissa. She quickly realized just how special this school is. They embody exactly what she has been speaking and writing about. Achieving huge change with few resources and ingenuity. Orissa is a region where the Government has barely any reach. Its tribal population, gravely oppressed, has been living in the forests for generations. They were effectively cut off from civilization, knowing next to nothing about the outside world. KISS started as a residential school in 1993 with 125 tribal children as students. It’s an initiative of Dr. Achyutananda Samanta to transform the face of tribal India using tools of knowledge and training. Today KISS is now a phenomenon, providing free education to 20,000 children from 62 tribes. It is also committed to sport. And no one would have imagined that the hands-down most popular sport in a tribal Indian school would be rugby. These young players (including girls) are freakishly talented and athletic, considering they were only introduced to the game this decade. And rugby has opened up the world to them, literally. They’ve travelled to England and Australia and met players from all over the globe. Rugby has changed their perspective on life. It’s inspired them to believe in achieving the seemingly impossible. As one of the players points out, rugby has taught him to be disciplined and to stand tall. He has learned to never think of himself as inferior to anyone else. To break out of the poverty cycle, youth, wherever they are, need to be given the opportunity to realize their potential. KISS is winning on this front. Simone tells me she plans to produce a documentary on the power of social entrepreneurship, and that of rugby to build physical and emotional strength and provide a path out of poverty for these youngsters. I can’t wait to see it. We all want work to be meaningful, for it to reflect who we are and contribute to our purpose in the world. Often people go about their daily work without thinking of how their actions could make a positive effect. Work becomes a drag. Problems ensue. Small ideas have the ability to make a significant different. 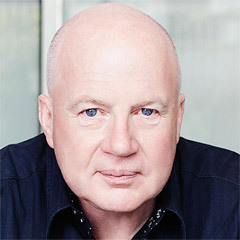 An example is how Saatchi & Saatchi S worked with Walmart to inspire positive behavioral change on a mass scale. Walmart recognised that there was an opportunity to spark a sustainable revolution that could improve the health and wellbeing of their staff. They wanted to wake their people up to the opportunities at work. The focus was to get people to make better choices for themselves and their community through Personal Sustainability Projects (PSP). You can read about it in more detail in a paper published in the Journal of Corporate Citizenship, Waking up at Work: Sustainability as a Catalyst for Organizational Change by Cynthia Scott, Presidio Graduate School, USA, and Andrew Bryson, Saatchi & Saatchi S, USA and now with us in Singapore. The point is that you don’t need grand ideas to trigger action. The magic of PSP is that it’s not a top-down instruction dispatched by some droll corporate office. It’s a simple proposition that encourages people to voluntarily make a change. Even if it’s just one simple act. Like turning the tap off when you brush your teeth. A collective 1.36 million kg of plastic was recycled. 83,000kg in weight was lost from healthy living choices. Nearly 20,000 people quit smoking. A used-tyre recycling programme was established. Wildlife areas were cleaned up. Two companies. One simple idea. An article in the August issue of Decanter brings together two joys of life: Illy coffee and Brunello di Montalcino. Illy is the definitive espresso brand in the world. Every day more than six million cups of Illy coffee are drunk in 140 countries. Illy is a client of Saatchi & Saatchi Italy – and since 2008 the Illy family have been owner of the Mastrojanni vineyard in Montalcino, the classic Tuscan hilltop village just south of Siena. Brunello di Montalcino is one Italy's most famous and prestigious wines, sharing the top spot with only the highly-prized Vino Nobile di Montepulciano and of course the ubiquitous Chianti. Brunello translates roughly as 'little dark one', and is the vernacular name for the large-berried form of Sangiovese from which the wine is exclusively made from. The Decanter issue also features an article on Brunello’s junior sibling, Rosso di Montalcino, an affordable wine with great structure. If you’ve been following this blog, you’ll know that I have referenced Malcolm Gladwell’s “10,000-Hour Rule” a few times in the context of the study of expertise. The idea is that to become an expert at anything you need to apply yourself to it for at least 10,000 hours. Well, a book by Sports Illustrator writer David Epstein argues that the formula is more complicated than that. The Sports Gene is the result of Epstein’s curiosity about why Jamaican and Kenyan runners at track events were more exceptional, and why the same training regime resulted in different types of runners. What Epstein found is that biology does play a major role in the amount of success an athlete will have in a particular sport. Meaning that given your biological make-up, you might be better suited for football than running or gymnastic than swimming. This is common sense. It takes a particular build and force to be a rugby player. You won’t find the same physique running across the field in an English Premiere League final. Epstein makes clear that a one-size-fits-all approach to training won’t result in everyone achieving at the same level of success, because people require different training plans depending on the biology and physiology. The “10,000-Hour Rule” is merely an average of differences. So while one person might master a skill quickly; it might take another person 20,000 hours to get it right. “Some people’s alphabet soup – meaning their DNA – didn’t ‘spell runner,” quotes Epstein. And that’s true. It’s really about having a good knowledge of who we are, where we come from, and looking our strengths and weaknesses dead set in the eye. We are all individual. Different from each other, and one of the first steps to winning is having a deep appreciation for that. Malcolm Gladwell has written what amounts to an appreciative rebuttal in the latest New Yorker, saying that the 10,000-hour rule applied to cognitively demanding fields that needed significant thought and in which there are no naturals, unlike those runners and dart-throwers. Winning is a habit, and in sport, the best teams in the world are the ones who deliver. Year on year. The Miami Heat did it this year in the NBA. In Super 15 Rugby involving teams from Australia, South Africa, New Zealand and Argentina, the Waikato Chiefs are the back-to-back champions. It’s a feat only two other teams have achieved in the history of the competition. 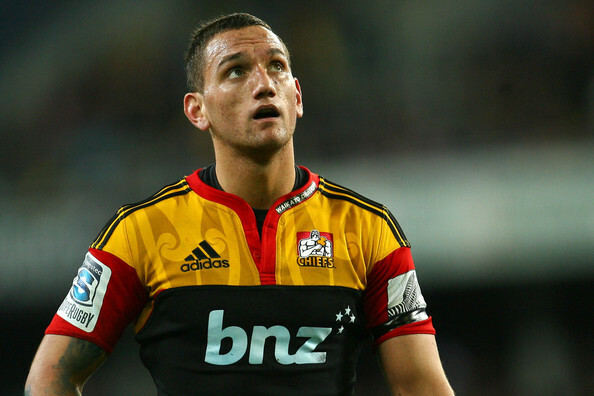 The Waikato is a traditional rugby stronghold, but in this professional era, what is the secret of their success? In the Peak Performance work I did a decade or more ago with colleagues at the University of Waikato, in analyzing the success factors of several of the world’s top sporting teams there was a particular word that kept on coming back at us. It wasn’t talent, or superstars, or brilliance, but family. The feeling and bonding of the team as family. The Chiefs have just elevated the idea one or two rungs higher, especially when the Maori concepts of whanau (families) and whakapapa (genealogy, family tree, the paradigm of cultural discourse) are involved. As a device to concentrate their minds during the week of the championship final, the Chiefs coaches had a Maori pa (village) drawn on a wall at their Ruakura base. Inside the sketched village were attached photos of the players' wives, children, parents and friends - a powerful reminder of where they have come from and whom they were playing for. A copy was made and taken to their Waikato Stadium changing room on finals night. It was one of the last things they saw as they ran out onto the field and, given they were behind 16-9 at the break, they needed every advantage they could get, mental or otherwise, when they took to the pitch for the second half. In 2011 under new coach Dave Rennie the team connected with the Maori population, culture, and history that the team’s logo invokes. These efforts included using Maori names and philosophical concepts as a framework for their various game plan elements, as well as using tribal names in their team organization. As the 2012 season went on, the team began to include more Maori elements in their uniforms and identity. Their early season jersey had added sublimated Maori designs by the end of the year. They continued to include Maori cultural performers at the games. 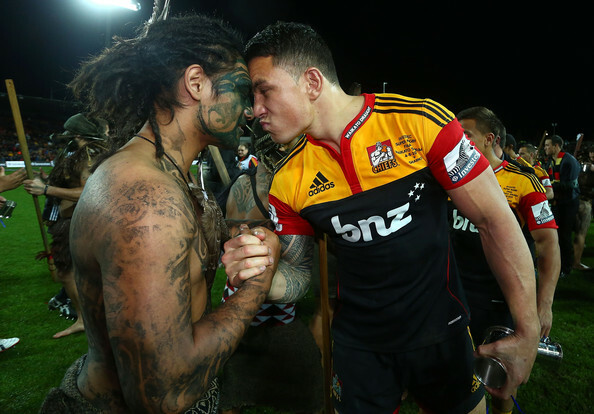 In 2013 the Chiefs are continuing their connection to Maori culture. As part of their preseason training they followed a path connected to a historic Maori migration. The trip included not only exercise, but some time to connect with traditional Maori communities. Most unexpected was the Chiefs’ development of their very own haka. While many schools have their own hakas, and the national teams have their own, this was a first at Super Rugby level. The team quietly created and practiced the haka and debuted it only after winning the 2012 Super Rugby final – and reprised it again after the 2013 win. The US website Racialicious.com which is about the intersection of race and pop culture has a detailed piece by Caleb Borchers on The Chiefs, which this post draws directly from and goes onto discuss the issue of Native American branding and imagery in US sports, concluding there is much to learn from the New Zealand experience. Final word goes to coach Rennie who when asked about the family journey talked about the “themeing we've done this year." It’s so refreshing to hear a coach talk themes not just tactics! There was a time when if you wanted to set up your own business, you worked for someone else first, earned your stripes, and then went out on your own. That was the general rule. Walking out of school and setting up your own venture without any prior business experience was an exception. But rules are meant to be broken in today’s VUCA world. The young truly understand that ideas are the currency of today. You need to get to market quick. The ability to reach consumers through the internet has emboldened the young to try their hand. But though some are winning (and we hear a lot about them), there are many who aren’t. Young innovators and entrepreneurs are learning business skills on the hop. Staff management, sales, product development, marketing, branding. Trying to out manoeuvre competition that lays it on thick and fast. It can be a brutal lesson in survival. Winning is important because it perpetuates self-belief. It’s a law of attraction. Authority is earned. The more you win, the more authority you have. If you try to exert authority that isn’t yours, you’ll see trouble. If you want to win, start within. The success of many companies was built on the leadership of the captain at the helm. Improve your leadership skills. Find out where you need work, then practice, practice, practice. Look for quick improvements by making changes that require 20% work but make 80% difference. Surround yourself with people with drive and ambition. People who know how to win. People who can’t accept losing. Hire leaders, not followers. The difference between a business owner and an entrepreneur is that a business owner wants to open another shop and an entrepreneur wants to transform an industry. That’s how a recent piece in The Economist describes it. “True entrepreneurs find worth in the worthless and possibility in the impossible”. Daniel Isenberg is an entrepreneur, venture capitalist and academic, whose interest in what makes an entrepreneur has led him to study examples (both successes and failures) across the globe. In his book Worthless, Impossible and Stupid, Daniel makes the point that entrepreneurs are “contrarian value creators.” They see value where others see nothing. And he isn’t afraid to point out that it is profit that so often drives ideas. It’s about changing the world and the monetizing of ideas. Facebook is a multi-billion dollar company. It doesn’t need to be. But it is. M-Pesa is a small value money transferring system in Kenya that relies on ordinary cellphones to transfer money, pay bills, even buy groceries without banks. The service is so widely used, with $25 million a day being transferred, that M-Pesa agents are popping up everywhere including a Nairobi slum. The system is popular because banks are either too corrupt or not interested in serving the poor. iCow is another Kenyan mobile services that provides agricultural information to farmers so they can better look after their herds. Famously, the Libyan government-in-exile formed online, and much of the Arab Spring has its roots in social media. Finally, ‘Cyber-Grannies’, a group of British grandmothers who take time in their days to teach children in India online via Skype! The Internet provides people with unlimited possibilities for how to overcome government and community shortfalls, showing the power that the digital age has to completely transform the way we communicate, lead and run our lives. Lee Child is a fellow Cumbrian (North West England) who also has a home and office in Manhattan and, according to The New York Times this weekend, also favors minimalism in his interior design. His book sales however have a few more zeros on them than mine (he’s up to 22 million) – in good part because, according to Amazon.com reviewer Timothy J Mccarthy, “Getting a Reacher novel in the mail is a lot like being handed an ice cream cone on a sweltering summer day. It's simply not there for admiring or slowly savouring, you tuck right in and enjoy every lick. And like the cone, "Never Go Back" does not disappoint. Go Jack! Tangentially, there are more Reacher novels sold per capita in New Zealand than in any other country. Listen to a great interview with Radio New Zealand’s Jim Mora and Lee Child. Walter Chrysler once wrote, “The real secret of success is enthusiasm.” And if you’ve ever been to a talk where the presenter delivered a lacklustre performance, even when the idea or product was fantastic, you’ll agree with the sentiment behind Chrysler’s words. Because it’s not just about what you say, but also about how you say it. Enthusiasm is a key ingredient in any successful business. Enthusiasm is contagious, it’s motivational. People love it. The Greeks had a word for it. Enthusiasmos: literally, having the god within you. For that collective, contagious fervour the Welsh call Hwyl. Before your next presentation, pitch or conversation, ask yourself how excited you are about what you’re communicating. Make sure your language (both body and vocal) is a reflection of the amount of enthusiasm you have for it. If you’re not enthusiastic about it, maybe you need to reframe the situation. Why sell something you don’t believe in?